Ted Ponsonby hails from Letterkenny, Donegal and as well as song-writing, is also a Recording Producer & Engineer. 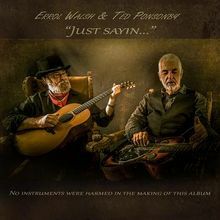 Ted’s specialities include Acoustic and electric guitars, and the Dobro resonator. As a founding member, Ted played with the renowned show band The Rascals during the 1970’s. After selling the Rascals name to the Wilder brothers in the early 1980’s, Ted has gone on to become one of the top session musicians and producers in Ireland. Although originally a rocker, Ted has changed his musical style considerably, and today plays more blues, country and traditional music around his native Letterkenny. He also continues to play live gigs in venues around the country on a regular basis – and luckily for us, Limavady is among those venues ! Over the years he has played and recorded in very good company including Dolores Keane, Sean Keane, The Henry Girls, Andy White, Freddie White, Kieran Goss, Frances Black, Maura O’Connell, Arty McGlynn, and many other noted Irish musicians – including a short stint with Van Morrison. Ted can be seen strutting his funky stuff with the Rascals on Youtube below. He is the yellow-trousered Reggae singing lead guitarist and vocalist…!